This is so sweet! Love the CAS style with the little wooden accents! That sentiment is perfect! Love the image and the sentiment. I really like those little wooden do-dads. Nice sky work also. Have a fun day. Lynn, your card is just too cute. I really like those wooden do-dads. They caught my eye immediately. I'm not very chatty, either. Allergies are killing me. Ugh! It Spring!!! What an adorable card! Love it!!! Super cute! Great coloring and you clouds always look amazing. Love the wooden do-dads too. So cute! And well done! Super cute! It's simple but makes a statement! These little owls are a treat!!! Love the look on their faces...this card is so darned cute!!! Greetings Lynn, love the stitching around the edges and your owls are adorable. Do-dads, is a great way to describe them. Cute card and love the sweet owls! You always create such pretty clouds! What a perfect card for Operation Write Home, Lynn!! Sensational clouds behind these adorable owls!! This is so adorable :) lovely sky !! Tumbled Glass ink, huh? May just have to add that to my Must Have list, hehehe. Love that sky. Those owls are just so sweet! Liking the doo dads too! Like the stitching around the border too. You never bore me at all whether you're chatty or not! 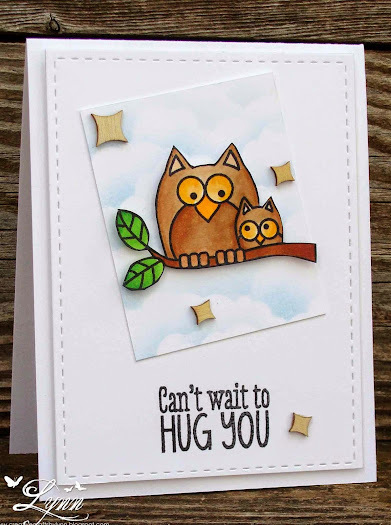 I just love that pierced rectangle with these little hooters and those wooden embellishments make this one super cute and fun card! This is darling, Lynn, and I love the little wooden "doo-dads" or whatever they're called. Cute owls and wonderful clouds! Adorable owls and a wonderful sentiment! Have a great weekend! Love it Lynn - cute as, and so well executed. Your post brought a grin. Wish I could be that brief!!! Love that cute owl, the clouds, and the die cut! Wen to lil' inkers and they will let me know when they have replenished their stock. Shame on you....bad influence!! 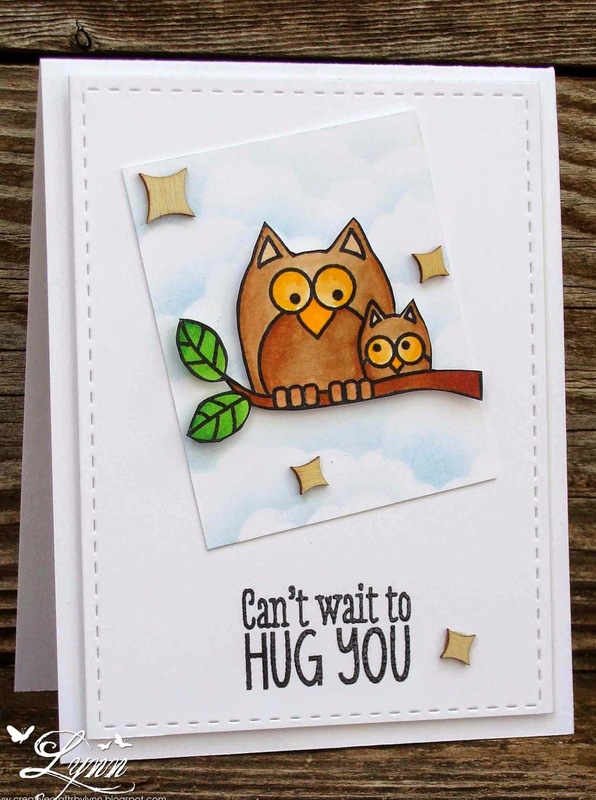 Do-dads totally sums it up :) I LOVE that sentiment, and the owls are sweetness all over! Oh these owls are wonderful. My youngest daughter loves owls and would love this card. it is beautiful! Your little owls are just precious, Lynn, and I love the little do dads..this is adorable!!!! I always wonder how to use those odd shaped pieces, and here you are making them look awesome!! Fabulous CAS card!